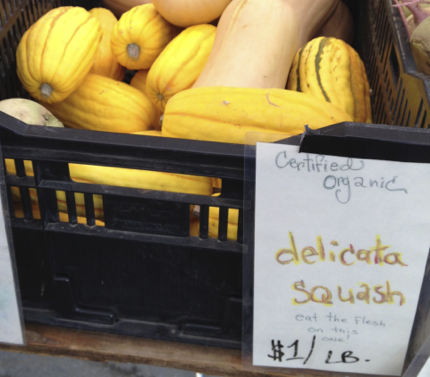 Delicata squash are available at Tomatero Farm and Blue House Farm! 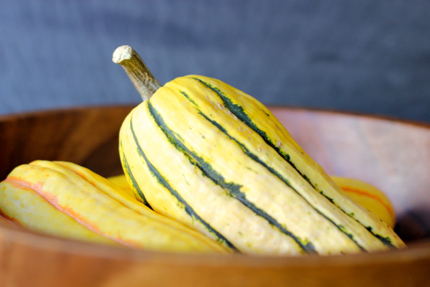 These striped beauties are sometimes referred to as sweet potato squash because they taste sweet and creamy. 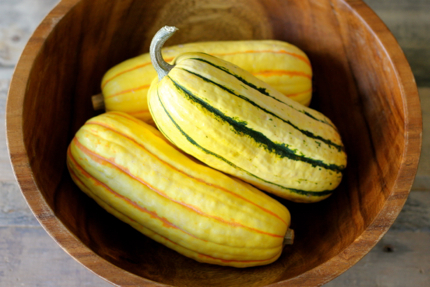 As the name suggests, Delicata squash have delicate, edible skin making them very easy to prepare. 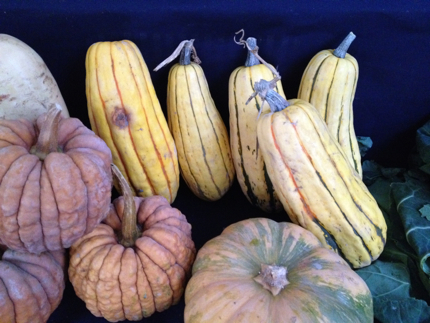 No need to remove a thick skin like other squash varieties. 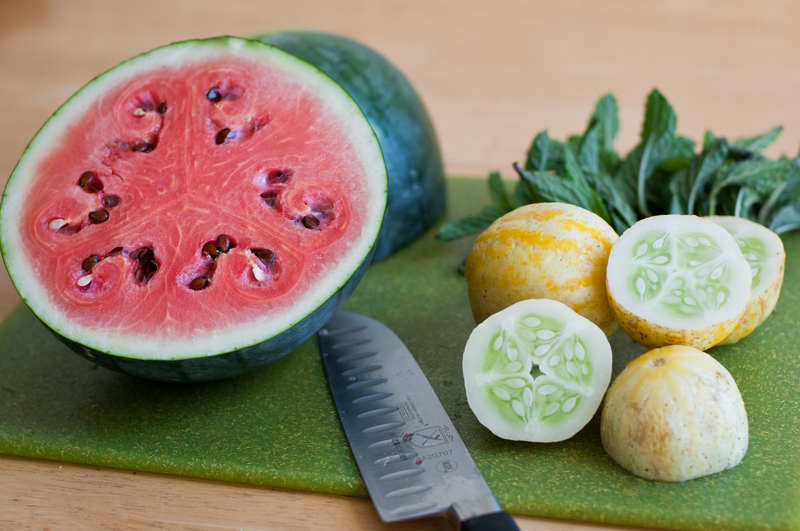 Simply slice in half lengthwise, scoop out the seeds, roast with the skin on, and enjoy! The simplest preparation for Delicata is to slice each half into pieces approximately 1/2 inch wide and toss with olive oil to coat, then sprinkle with salt and pepper. Then roast at 400° F until tender and slightly browned and caramelized, about 40 minutes. Another option is to cut into quarters, brush with cream, and sprinkle with parmesan cheese and sage. See the full recipe after the jump. 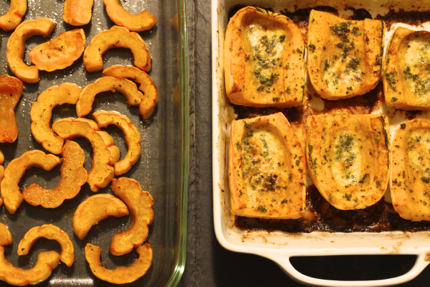 Both versions make a delicious addition to a fall meal, and they are also vegetarian and gluten-free which makes this dish great for bringing to holiday potlucks. Chef William and sous chef Connie from nearby Mission patisserie Craftsman and Wolves were spotted shopping at the Mission Community Market last Thursday. They are big fans of the market and can be found shopping at several vendor stalls almost every week. Last week they filled their cart with a variety of seasonal produce: kale and watermelon radishes from Tomatero Farm, apples from Hale Apple Farm, and quince from Arata Farm. Right now as the seasons are changing there are a rush of changes at the patisserie, with new items in the works. Chef William told us his favorite season is always the next one with all the excitement of new seasonal ingredients becoming available. Apples from Hale Apple Farm will be the market fruit paired with ‘damn fine’ granola and strauss yogurt. 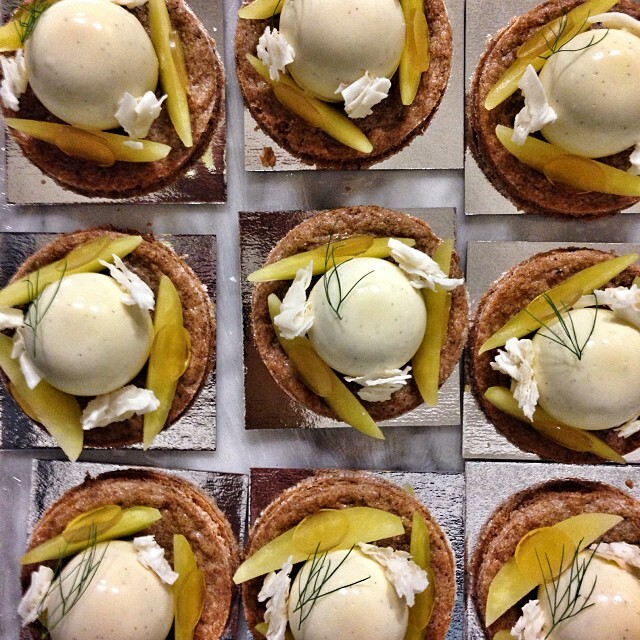 They are also for this exquisite apple & coconut tart with vanilla on a rye palet. Kale from Tomatero Farm is for the savory kale salad with white butter beans, parmesan cheese, and croutons. 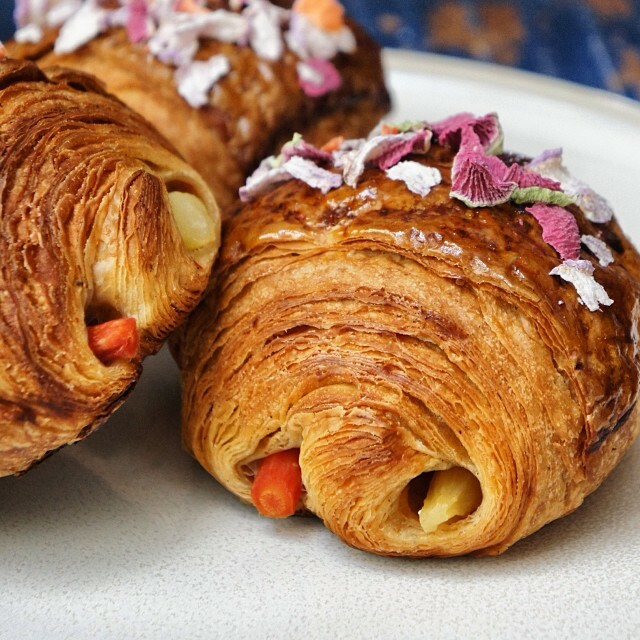 The watermelon radishes will be dehydrated into pretty pink petal-like chips to top this new root vegetable croissant laminated with harissa butter. Quince from Arata Farm is for a new cake being developed. 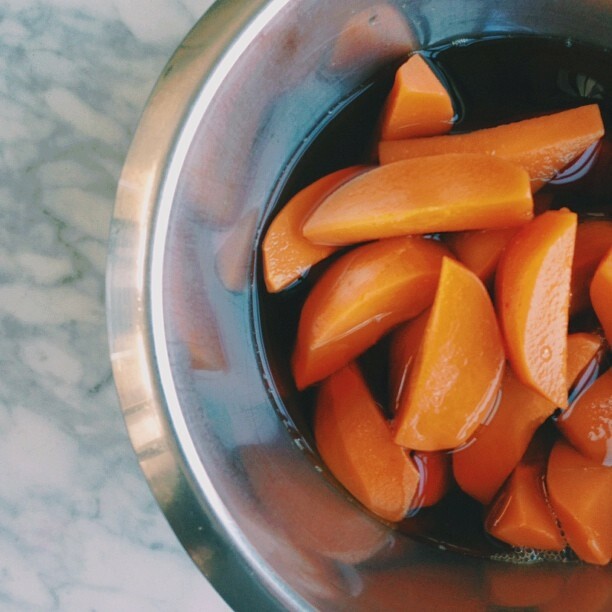 The quince will be cooked sous vide for four hours and then paired with brown butter, pomegranate, and blonde caramel. Sounds amazing! Here’s a sneak peak of the prepared fruit – check back at Craftsman and Wolves for when this new seasonal cake will be available. Craftsman and Wolves is located at 746 Valencia Street (between 18th and 19th Streets) in San Francisco’s Mission District. Open Monday-Thursday 7am-7pm, Saturday 8am-8pm, and Sunday 8am-7pm. 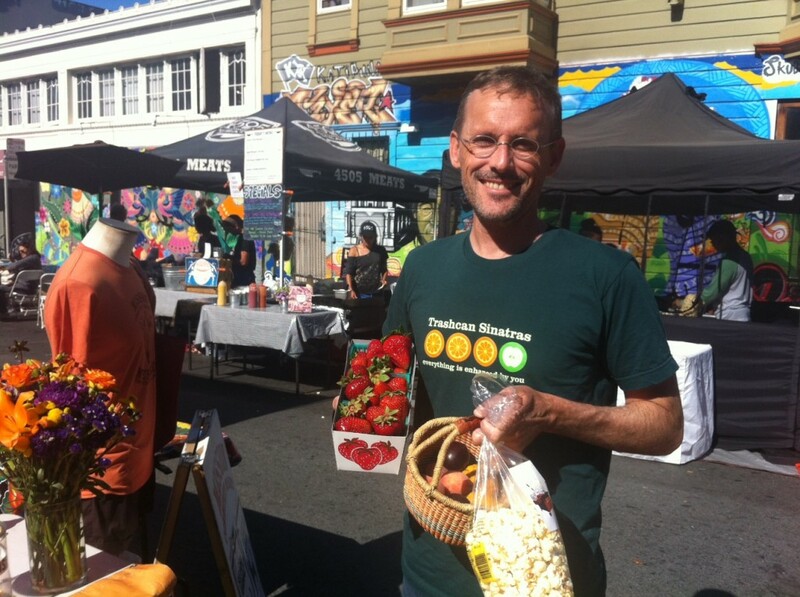 Stop by and check it out and you might taste some Mission Community Market produce on their menu! Note: MCM offers a reserved parking space for local restaurants and chefs picking up large orders at the market (at the end of Bartlett near 21st Street). To celebrate the beginning of summer and the start of the most delicious season, we made Agua Fresca. When the summer heat comes this transformable beverage is fantastic to sip on a warm afternoon or as a fresh accompaniment with a weekend breakfast. Easy to make and simply delicious, you can use just about any fruit you have on hand to make Agua Fresca and you can make it as sweet as you like by controlling the amount of sugar that you add. 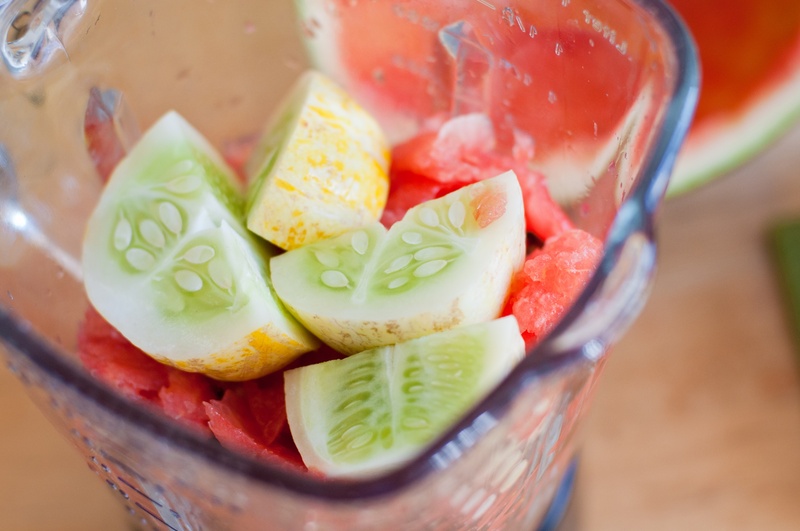 For this batch, we used juicy pink Watermelon from Tomatero Farm, bright Lemon Cucumbers from Happy Boy Farms, and crisp clean Mint from Blue House Farm. The Watermelon was ripe enough that we didn’t add very much sugar to assure that our beverage was refreshing and thirst-quenching and less dessert-like. Chandler – The most commonly grown variety across the United States, Sylvia from Yerena says that they are “the most juicy.” Although we do not have one pictured above, Chandler’s vary from being long and wedge-shaped to large and conical. Éclair – With their early season productivity a big plus for farmers, Sylvia likes this variety for their light sweetness. Typically, she says, they are white on the inside. Rosa – Another great choice, Spencer describes the Rosas as “smaller and juicier” with a more tropical flavor that is reminiscent of pineapple. 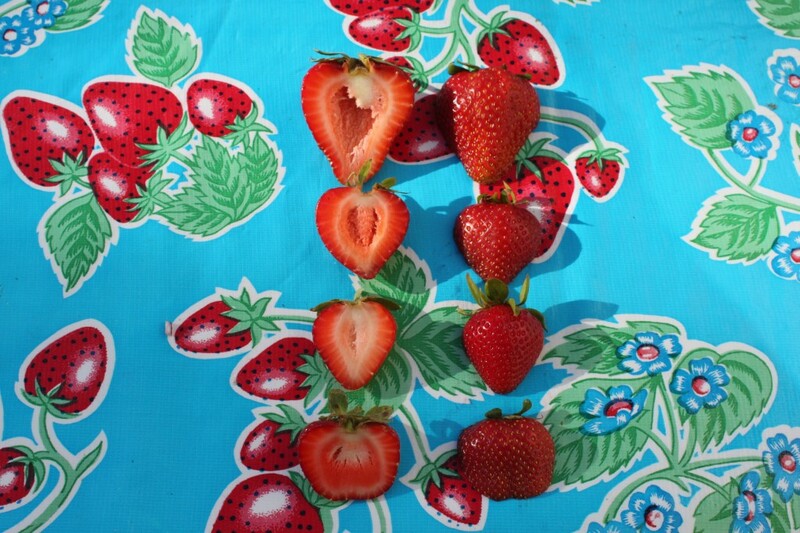 Sweet Ann – A newer variety on the strawberry scene that is making waves for being very flavorful, Spencer calls them “big, very sweet, and more juicy” than other varieties. They are larger, with medium firmness, and can have a sharper conical shape. So next time you are at the Mission Mercado, keep an eye out for these varieties and don’t hold back–ask the farmers which berry is right for you! Chris regularly comes to MCM with his family. 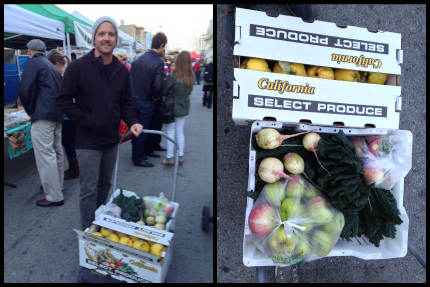 The rest of the family was feeling a little camera-shy, but they all love visiting the market! How often do you come to the MCM? Twice a month, after picking up the kids at the Friends School nearby. What are you buying? We always stop for kettle corn at Peter’s Kettle Corn! Today, we got fruit from Twin Girls, carrots and berries from Tomatero, some other veggies at Blue House. Sometimes we get a chicken from Roli Roti, or dinner from Chaac-Mool. We’ve also bought the ceviche from Shrimp & Love Ceviche. What’s your favorite part of the market? It’s very convenient and friendly. We love the live music, too. What’s the best kept secret at MCM, or something you would like people to know about? We tell all our friends to stop by, because you can easily find a parking spot on Valencia towards the beginning of the market.